Sometimes you make a dessert so simple and delicious, all you want to do is share it with the world. 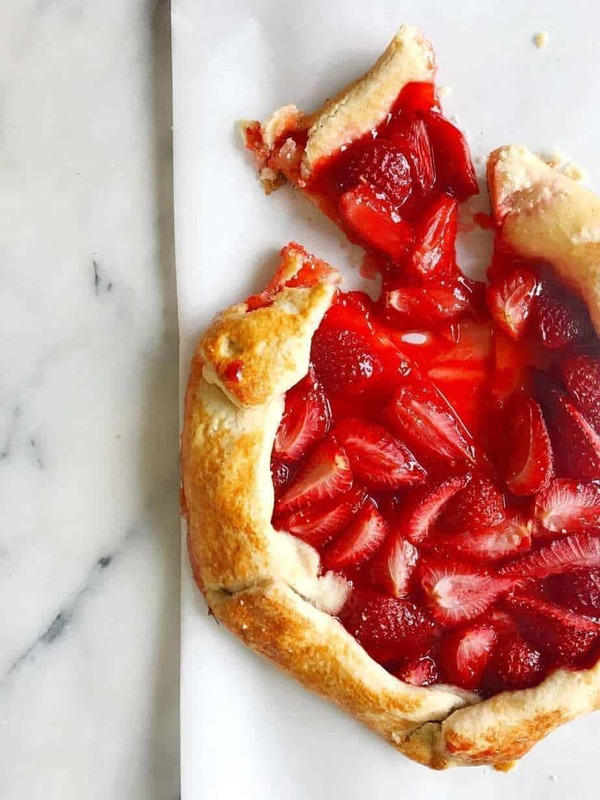 That’s how I feel about this Strawberry Galette. You guys know that I like coming up with dessert alternatives that won’t be too tough on my blood sugar. I love carbs, but carbs don’t reciprocate. This recipe really surprised me, but I did have a little help. Instead of white granulated sugar, I used Sugar 2.0. 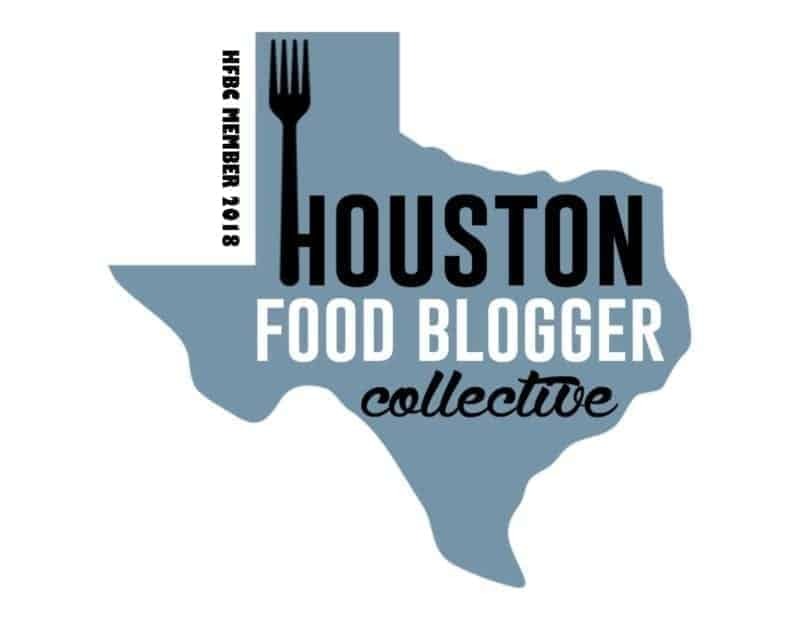 Sugar 2.0 is a natural, non-GMO, cane sugar substitute with half the sugar and 1/3 the calories. It’s done by including fiber in the product, which is so brilliant, it hurts. It measures cup for cup like sugar, bakes like it, tastes like it with no weird aftertaste, or side effects. In my test, it did spike my blood sugar, but not as much as pure white sugar, which I expected. The thing that really got me was how it added some sweetness in the same way that granulated sugar would, but it didn’t make my pastry overly sweet, or give it a strange aftertaste. If you ever use sugar substitutes you know that’s a good way to decide to throw one in the trash. It’s hard to find ones that bake and keep well. They are also oftentimes very expensive. 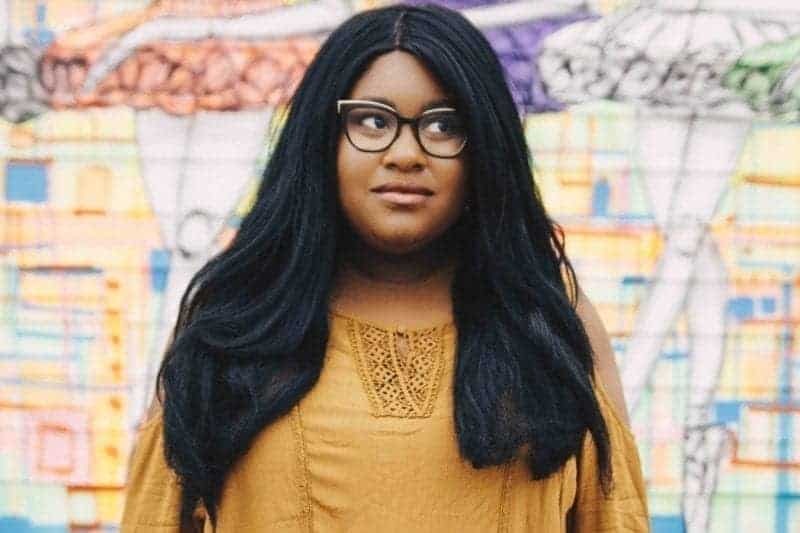 Sugar 2.0 is no different, but I will say it’s definitely worth it. 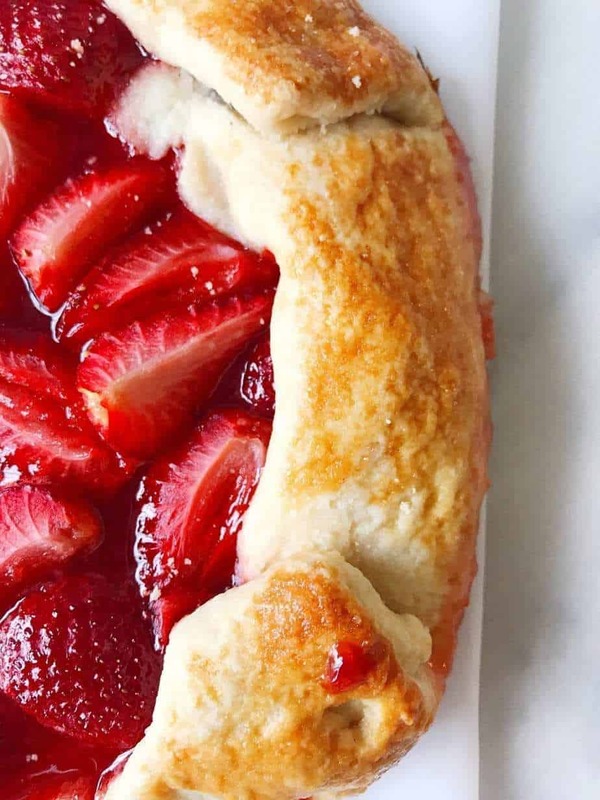 This strawberry galette is actually kind of genius. It uses really fresh, everyday ingredients (nothing you couldn’t find easily at the store). Additionally, it uses store-bought pie crust. To some, that’s a no-no, but there are a few ways that I enhance the crust I buy, and I also start with a great one (if you’re in Texas, you must use Texas Pie Company’s Dough Puck. Don’t argue, just do it). Store bought is going to save you time, and it’s not as bad as you think when done well. Now, what makes this a galette instead of a pie? To me, this defies a pie. It’s not made in a dish, it’s edges aren’t perfectly crimped, it’s extremely thin and dainty. It’s got shallow sides and no top. The free form nature of this means that it can come out looking 100 different ways, and they’re all okay. This one was a hit at my house (and I promise you, there are a lot of misses that never make it to this blog). But if there’s one thing I know for sure, it’s that you’re going to enjoy this. If there’s a second thing – it’s that people are going to be begging for this recipe once you make it for them. 1 1/4 cups of sugar (I used a sugar substitute called Sugar 2.0. 1 sheet of store-bought dough (I used Texas Pie Company Pie Puck, which is amazing). 1 egg + 1 tablespoon of water for egg wash.
Thaw your dough according to the package you purchased. Take the leaves off of your strawberries, rinse and quarter them. In a bowl, mix 1 cup of sugar, lemon juice, and half of your lemon zest. Throw your strawberries in and coat them in the mixture. Then, set aside. Sprinkle your dough with salt, and roll it out to about a 1/4 of an inch thick. (I prefer to do this on parchment paper for as little mess as possible. 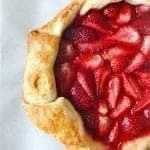 Place your macerated strawberries and pour the whole mixture out into the middle of the dough. Spread it for even coverage. Sprinkle the rest of your lemon zest on top. Fold the edges of your crust how ever you\'d like (braided, a simple fold, etc). Whatever you do make sure these layers are equal so that the dough cooks all the way through. Brush your dough with an egg wash, making sure to coat all areas evenly. Then sprinkle with the remaining sugar mix. Place in the oven for 30 minutes - check to make sure your dough is cooked through, if not, let it cook for 10 more minutes and check again. Continue until the dough is thoroughly cooked through. Slice and enjoy with some fresh whipped cream, or a guilt-free ice cream. Previous Post Don’t be so judgy toward people with diabetes. I typically only eat desserts with chocolate in them, but this looks like something i’d like! THis looks AMAZING! 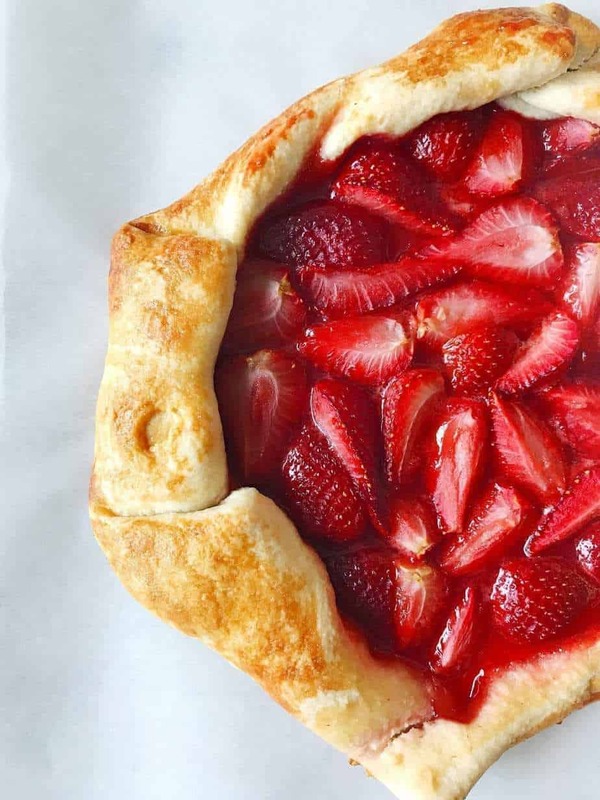 WE have so many strawberries in my house right now I feel like this recipe is calling my name! It is beautiful to look at and I am sure even better to eat! There is nothing like a fresh strawberry dessert in the summertime! I am having brunch at home soon with the gals and this would be perfect! What a delicious looking tart. You couldn’t get anymore clear and crisp with those pictures if you tried. Well done!! This looks amazingly delicious! Pinned it to try this weekend! This looks so bright and tasty! I would eat this for brunch or for dessert with a scoop of ice cream. I love strawberries and my mom just gave me a bunch of fresh ones she picked herself! Looks like I need to get busy in the kitchen! My goodness, what a tart!! I would have thought it was much more complicated to make! This tart is absolutely beautiful! A perfect way to kick off summer! Saving this recipe! This tart looks so luscious! Can’t wait to try it out with fresh summer strawberries. This is a beautiful strawberry tart! I love the sugar subsitute too. I’ll be picking up some strawberries from the farmers market to try this out. 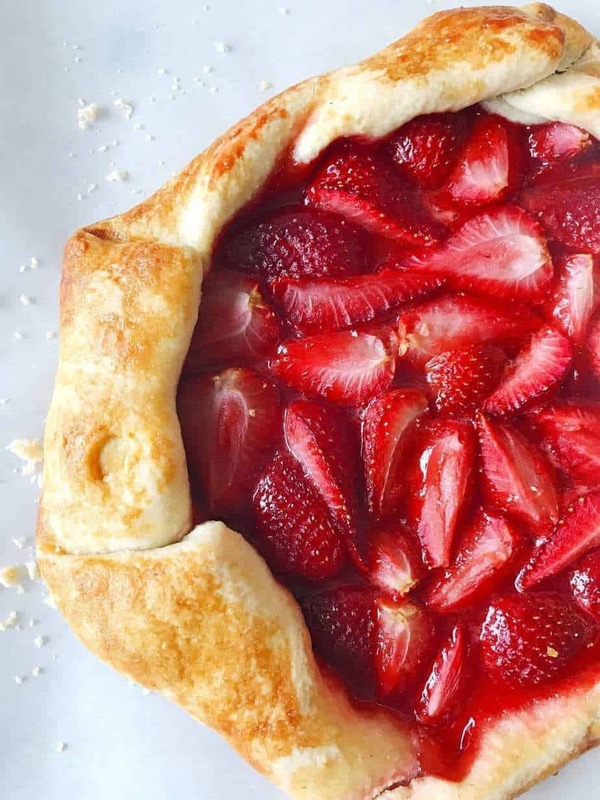 What a lovely tart for summer! See, I would have thought this was more complicated than you make it out to be! Good to know and kudos for the sugar substitute. It is a beautiful dish!